My daughter loves the big, soft pretzels. I bet she would really like these! Not difficult to make, either. Those look great! !!! Bet the boys would like those! This looks fantastic; I adore freshly made pretzels! I love the Tightwad Gazette! My husband bought me the complete edition for Christmas last year and I read it for days and days. It is somewhat outdated, but still has many many helpful tips. Thanks for sharing this recipe. Those look wonderful!! I used to make my own breads all the time. Now I don't because they all call for yeast and sugar. These look really wonderful! I love old books too. I love a New York Street Vendor pretzel.. but these looks ten times better. Yum - there is nothing quite like a fresh pretzel (with a little mustard). Thanks for hosting! That looks absolutely delicious! I am a huge pretzel lover!! Oh yum! I've said it before and I'll say it again...all of your boys are so lucky to have you cooking for them! i will definitely try these! i used to make homemade pretzels when i was a girl and loved them. thanks for sharing! I'm sorry I haven't commented much! I've been reading but haven't taken the time to comment. I hope everything is well for you! I like how you made a heart out of one. Cute! Sounds a little like my bagel recipe -- they look delish. Great job, Lisa. I made those before. That was one of the first things I learned how to make. It was part of a cooking class I took in school. It's a super fun recipe and tastes well. I've had different dipping sauces, just ate them plain and made what I called Pretzel Pizza. It was the crust for the pizza. Thanks for the recipe Lisa. Wow, they look delicious. I love the shapes you made. Those pretzels look so delicious and the instructions seem easy enough. I may have to get that book you speak of if I don't find a job soon! They look yummy. I could certainly go for one of those. Being low carb since January I do miss the bread items. Those look yummy! He can laugh all he wants at the Tightwad Gazette, I bet the founders are doing just fine right now between their thrifty ways and that publication. Your recipe sounds easy to make. I will have to try your version. Hope you have a great day. What fun ... Good heart, is to ... Eat it! Greetings. Ohhh, I love a good soft pretzel dipped in cheese sauce. These look delicious! 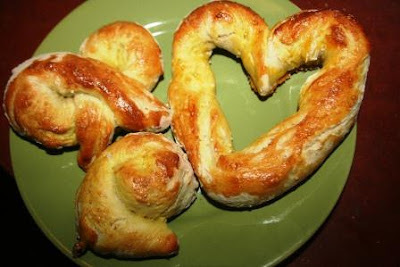 I love pretzels and just may get adventurous and try making these. we would love one too! we wish you could come make us some! Hi Lisa, OH--how I love those big, fat pretzels.... YUM---that looks so so so good... Thanks! I love soft pretzels and these look so yummy. Thanks for hosting. I'll be back to visit others.